We hear good things about this market in Palmer Park. Admission is free. Located in lovely Palmer Park, at the corner of South Carrollton and South Claiborne Avenues, last stop of the historic St. Charles streetcar. It’s Carnival Time at Arts Market of New Orleans! 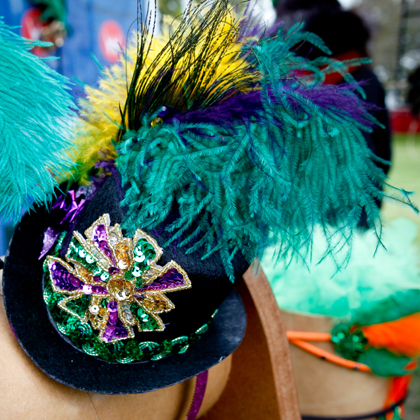 You may just find the perfect piece for your Mardi Gras ensemble amongst the offerings from our local and regional Fine Artists & Craftspeople. Between 50 and 100 artists display and sell their wares each month. Styles of art include painting, photography, ceramics, glass, jewelry, wood, and printmaking, plus handmade clothing, soap, candles, and other delights. Oh, and don’t forget all the fabulous food, live music and activities for kids.